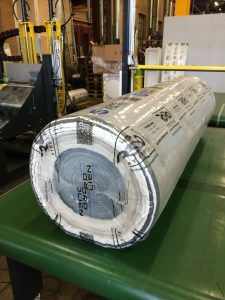 Automation in packaging in the geotextile and geomembrane industry is now seeing an innovative move by Frank Bruhn ApS. The proven horizontal stretch packaging technology - RoRo StretchPack - originates from decades of experience in the vertical stretch hood industry. Frank Bruhn ApS is now introducing a rock solid value proposition to the textile manufacturing industry as well as for geotextiles, fabrics, membranes including geomembranes when it comes to automation in packaging? See the short video and learn how! Are you interested in more details ? Then please drop an e-mail to bbj@www.tentoma.com and you will receive an invitation to our upcoming webinar about going from manual packaging of textile, various, fabrics, geotextile, membranes, geomembrane in rolls and alike to a fully automated packaging process. The savings are attractive in respect to considerable plastic packaging material (PE-film) savings, FTE reduction and on top of that? With the RoRo StretchPack horizontal packaging equipment you get a 100% water resistant packaging. One challenge in the textile industry is to succeed with a packaging that doesn't need to be overpacked in order be 100% water resistant which is critical in order to keep the rolls and alike fully intact. With RoRo StretchPack you obtain a 100% water resistant packaging (6-side closed) in a maximum 40 seconds automated packaging process with a minimal use of packaging material.